“I’ll eat just about anything in India if the place is busy,” celebrity chef and author Anthony Bourdain had unabashedly confessed in a interview to Nat Geo. This weekend we were shocked and saddened when we read about his death. To remember him, we traced his trail when he visited Bengal for his show, No Reservations. From the sleek Amtrak to the second class sleeper compartment of Indian Railways, Anthony Bourdain’s eagerness to explore and accept is a lesson to reckon with. Used to comforts of flights and the AC, it wouldn’t be to bad to follow Bourdain and travel second class in the Indian Railways to enjoy the sights and sounds of recurring vendors, fellow passengers, an occasional transgender and the changing landscape outside. Give your inhibitions a toss to start a friendly chat with a fellow passenger or better yet give the salted cucumber a try just like Bourdain did. Watch the show here. Standing on the banks of River Ganges, Kolkata’s centuries old ghats are as unique to it as is their history. Follow Bourdain and visit the several ghats that line our city’s banks like Prinsep, Babughat, Mullick, Baghbazar which not only afford mesmerising views of the river and the city, but are also significant sites that narrate history. Bourdain visited the Loha Ghat (the Zenana Ghat that was only open to women) and also the akharas for mud wrestling that stand close to the ghats in Bara Bazar. With just three akharas surving now, explore these facets of Kolkata before they die out. Bourdain’s keen sense of observation was one of the many reasons he could get to the pulse of any city so well. Leaving aside the eponymous city landmark New Market, Bourdain headed to the wholesale flower market at Mullick Ghat. Standing at the ghat, while he couldn’t help himself from drawing parallels between the Howrah Bridge and that of his hometown’s Brooklyn Bridge, the sensory experience of the vibrant flower market left him overwhelmed. Head to this fascinating market to seep into the city’s vibe and indulge in some deep-fried deliciousness of handmade kochuri and aloo bhaja, like he did. 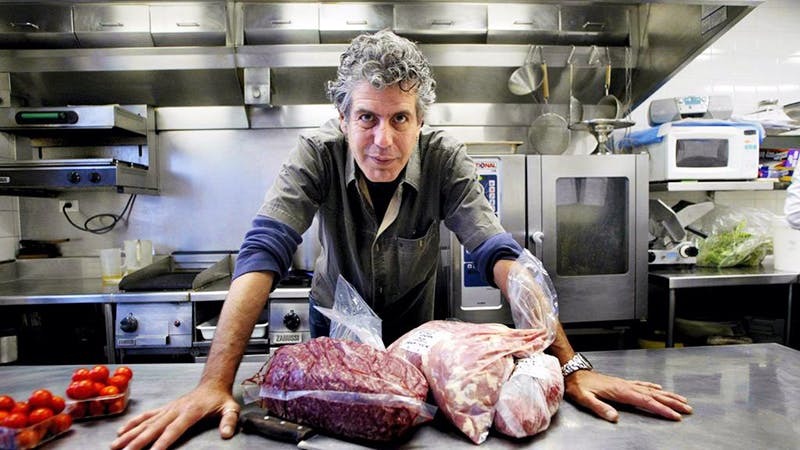 Bourdain was known to break moulds with a passion, and keeping up with this reputation, he ditched the oft-celebrated dining experience at Park Street and chose to explore the expanse of the sprawling Maidan. Pick up the cricket bat like him or join one of the groups that practice football to get your dose of outdoor fun in the open green space. Bourdain went to town munching on jhal muri and papri chat (calling it nachos!) and sanguinely concluded that fast food can also be good food. This aside, you can also try visiting the tents there and try a hearty meal of Kolkata’s famous ‘ishtews’. Look here for more info. An intrepid traveller with a quick and sharp wit, Bourdain was an explorer of food, international culture and diverse human conditions. On his No Reservations visit to Kolkata, he took a trip to the Sundarbans and stayed in the island of Bali. While he relished the local food of rice, brinjal fry, dal, scallion sabzi, bhetki and prawn curry, his wasn’t the first-world tinted gaze that was acutely awareness of the differences in living conditions. Instead, he schooled us city dwellers to appreciate hardwork and the back-breaking labour that the locals have to put in as a way of sustenance. Follow Bourdain’s trail to this deltaic region and experience this culture first hand. Check here, here and here for more info to plan your trip.